Having trouble passing the California Smog Check? With our more than 10 years of experience, Smog Check Pros is here to help you in every step of your Smog Check Inspection. The State of California DMV requires Smog Check Stations to perform the three specific tests listed below during a smog check inspection. 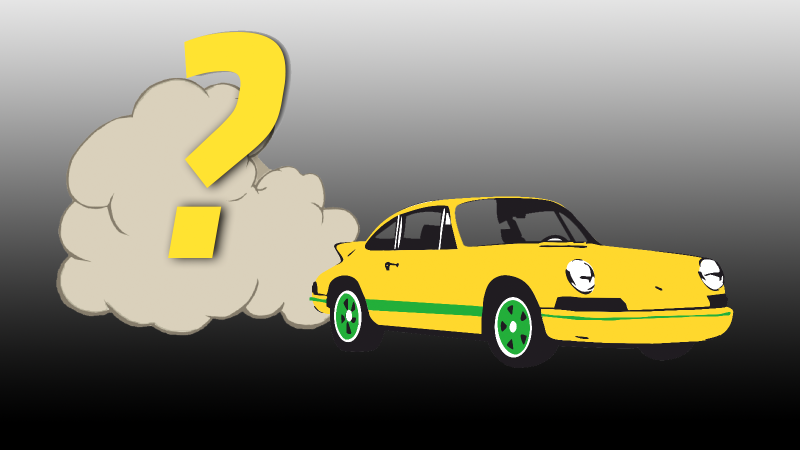 In order to pass the DMV Smog Check in California, your vehicle must pass all three tests ! The first inspection (emissions inspection) is performed by the smog check machine (called an exhaust gas analyzer). During this step of the smog check inspection, the smog check machine is looking for the presence of Hydrocarbons (HC), Carbon Monoxide (CO), and Nitrogen Oxide (NOx) in your vehicle's exhaust. These are the 3 undesired chemicals which are responsible for the production of smog. The emissions inspection portion of the smog check inspection will measure your vehicle's HC, CO and NOx production, and insure they are within the limits set by the State of California. Your vehicle's CO2 and O2 emissions are measured as well, however these results do not effect passing or failing the emission test. During the visual inspection portion of the smog check inspection, the technician visually checks the vehicle to make sure that all of the emissions components are present and properly connected. The visual portion of the smog check inspection will include a "visible smoke test" as well. The smog check technician must locate and make sure that all the emissions components required for your vehicle are properly connected. In addition to the emissions components, the smog check technician will also be looking for any defective or disconnected vacuum hoses, electrical connections, or fuel leaks which would effect engine performance and ultimately cause the vehicle to release smog into the air. Make sure that your vehicle does not have any modifications or aftermarket components that are not approved by the vehicle manufacturer or California Air Resources Board (C.A.R.B.) If you see any broken hoses or defective components, have them repaired before the smog check inspection. During a Smog Check Inspection, vehicles are also inspected for excessive smoke being emitted from the exhaust (tailpipe). This test is in addition to the emissions inspection. Excessive smoke, either black, white or blue will cause a smog check failure. If your vehicle is emitting visible smoke from the tailpipe or the engine, you will need to have the problem diagnosed an repaired before it can pass the smog check. Visible smoke from the tailpipe or engine are may be an indication of severe engine damage. The final part of the smog check inspection is the functional inspection. The smog check technician will ensure proper operation of the following components of your vehicle. During the smog check functional test, the smog check technician will be looking for an illuminated check engine light (known as the MIL or Service engine soon light. The only time the smog check technician wants to see the check engine light on is when the ignition is in the ON position, and the engine is not running. The MIL light has to immediately turn OFF when the engine is started. Your vehicle will also fail this test if the check engine light does not illuminate at all. - If the MIL light does not illuminate at all, or stays on after the engine is started, have the vehicle repaired before getting a smog check inspection in order to avoid a failure. The second part of the Check Engine Light test applies to 1996 and newer vehicles. These vehicles are equipped with an On Board Diagnosis (OBD II) system. During the smog check inspection, the technician will attach your vehicle to the smog machine (via the OBDII data link connector located in the footwell under your steering wheel). The OBDII link will transmit the data from your vehicle's on board computer to the smog check analyzer. If there are any faults present, the smog machine will fail the vehicle. The OBDII diagnostic system is designed to monitor your vehicle's emission control systems, and notify the driver of any faults (Check Engine Light). If the Check Engine light is on, the vehicle needs immediate diagnosis and repair. - The OBDII Functional Test also checks the readiness status of your vehicle's on board computer. If you recently have disconnected/replaced the battery or cleared the check engine light with a scanner, you must drive the vehicle for one week under normal driving conditions (to insure that the on board computer is ready and has run all of the monitors). - If the check engine light is illuminated, we advise finding a reputable smog check repair station to diagnose the check engine or service engine soon light. In the long run, you will save more time and money by properly repairing your vehicle than trying to avoid detection and/or repairs. Remember, your vehicle wastes more fuel when it is not running properly !